In a small sauce pot, combine the rice and 1 cup [1½ cups] water. Bring to a boil, reduce to a simmer, cover, and cook until the rice is tender and the liquid is absorbed, 15 to 20 minutes. Fluff with a fork, cover, and keep warm. Cut the apple lengthwise into quarters and cut away the core; cut each quarter lengthwise into ½-inch-thick slices, then crosswise into ½-inch cubes. Trim the root ends from the scallions; thinly slice the scallions, keeping the white and green parts separate. Set aside the green parts for garnish. Rinse the shrimp, then drain on a paper-towel-lined plate and pat dry. Season lightly with salt and pepper. In a small bowl, stir together the tuk trey sauce base, 1½ teaspoons [1 TBL] lime juice, and 1 tablespoon [2 TBL] water. Set aside for serving. In a wok or large frying pan over medium-high heat, warm 1 to 2 tablespoons oil until hot but not smoking. Stir in the apple and white parts of the scallions and cook until starting to soften, 1 to 2 minutes. 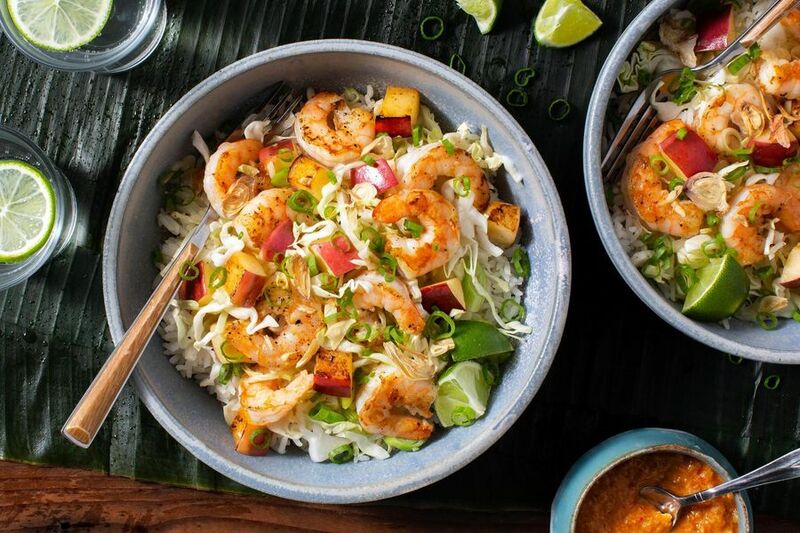 Working in batches if needed, add the shrimp and cook, turning once, until firm and cooked through, 1 to 2 minutes per side for regular shrimp, 2 to 3 minutes per side for jumbo shrimp. Remove from the heat, return all the shrimp to the pan, and stir in the cabbage. Season to taste with salt and pepper. Transfer the rice to individual bowls, top with the shrimp stir-fry, and garnish with the fried shallots and green parts of the scallions. Serve the tuk trey sauce and lime wedges on the side. Measure the water for the rice. Garnish with the fried shallots and scallions. This fast shrimp stir-fry hits every taste bud, thanks to the salty, sweet, tangy, and mildly spicy Cambodian tuk trey sauce. For added flavor, marinate the shrimp in half the tuk trey sauce before cooking the stir-fry, then serve the remaining sauce alongside. Sambal oelek is one of our favorite tools to bring heat and flavor to a dish. Sambal is an Indonesian term for a sauce made with chiles, and oelek refers to the mortar and pestle traditionally used to make it. We use a dab in the tuk trey sauce so it’s just a little spicy but not fiery. Calories: 640, Protein: 35g (70% DV), Fiber: 9g (36% DV), Total Fat: 17g (26% DV), Monounsaturated Fat: 7g, Polyunsaturated Fat: 2.5g, Saturated Fat: 2.5g (13% DV), Cholesterol: 215mg (72% DV), Sodium: 1270mg (53% DV), Carbohydrates: 82g (27% DV), Total Sugars: 17g, Added Sugars: (coconut sugar): 1g (2% DV).